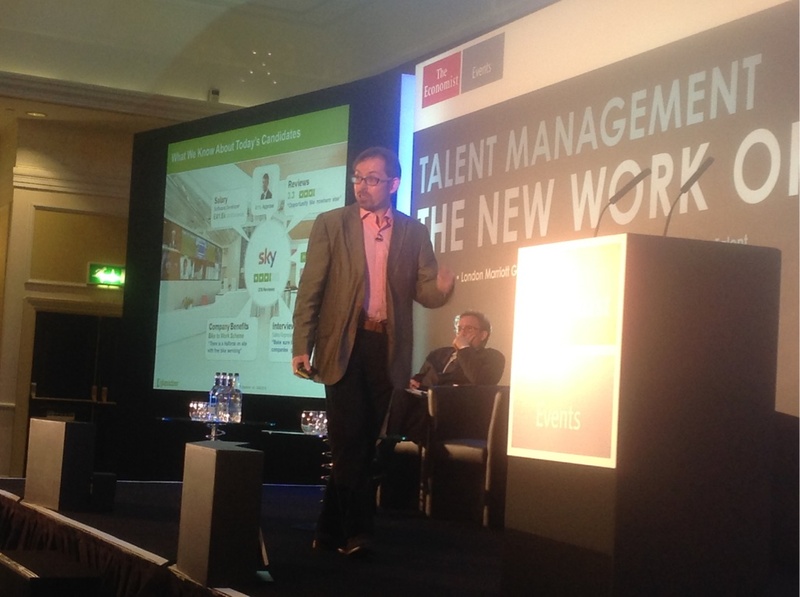 Yesterday I was at Skillsoft's EMEA Perspectives event where I was chairing a 'think tank' on the skills gap. The best session for me was John Ambrose on 'the self developing organisation', being firstly what Skillsoft and SumTotal are trying to create through their integration of content and platform (and the demo of this looked compelling) but secondly, a response to the difficulty getting people to engage in learning as much as they're going to need to, and having organisations sponsor this. Learning needs to be consumerised and collaborative - pervasive, multimodal, provided in the way that learners like to learn. A key part of this is understanding the audience. People undertaking learning need us to know, entice, improve and reward them. The reward part of this attracted a few comments - I think the idea was mainly around making the consumption of learning easy and stimulating ('so good that people want to eat it') but the demo also showed how someone might be promoted to sign up for an additional 2 days vacation, as well as volunteering to be a mentor in their new skill area. This understanding of the individual helps personalise the learning. We talked about this in the think tank too. That we don't have to think in terms of stereotypes like millennial etc, and develop learning pathways we suit particular groups, the technology is starting ot help us recognise individual needs and respond to these. It's then about pushing content for you to use, recommending additional courses or other learning, a bit like sites like Coursera, Udemy, Lynda etc do if you use these. Karen Moloney spoke about this in her session too, suggesting the key was to trouble people as little as you can. One reason I liked the approach is that is seems to respond to one of the other things I've been blogging about which is the need to align not just with the business, but with the individuals engaging in learning. See my posts on this (1, 2, 3) and Nick Shackleton Jones shared this post too - business alignment is killing you. Caan also provided a great example of doing some opportunistic recruitment and I thought it was a shame, though understandable, that one of the questions suggested attendees would be laughed at if we tried to do this back in the corporate ranch. Because the same applies to opportunistic development - finding those hooks that can enable someone to move themselves forward and potentially transform their own capabilities. I think the self developing organisation has the potential of being an important part of this people centric future. So after covering the way the world of work is changing we moved on to a final couple of sessions looking more specifically at the employment and skills challenges of the ‘new machine age’, building on Charlie Mayfield’s points in the morning morning. But first, another summary of the change. We’re moving into the third age of computing: tabulating, programming and now cognitive (eg IBM Watson.) 80% of people are going to be connected using digital devices by 2030. And billions of these devices will be connected together. We need to take advantage of these technologies - as Sir Clive Woodward has noted, talent is not enough - whoever wins in IT tends to win. Ram Sundarajan from HCL Technologies suggested the main impact of these changes is about speed, and in particular the use of data to help us make decisions differently. Kim Wylie from Google for Work suggested the number one goals for using them is improved efficiency. I thought Kim got closer to the mark later on when she started talking about Google’s culture and needing to ensure all their employees have a sufficient level of Googliness. Some of these changes are about culture, some of them about technology. But they all involve some of both, i.e. OD, culture and technology all merge together. But as Charlie Mayfield was suggesting, digital technology is also going to have a profound impact on jobs. 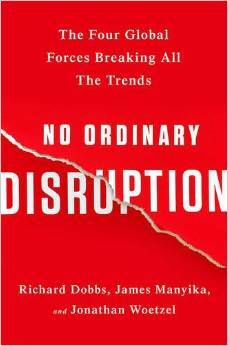 40-50% of jobs are threatened to disappear. And Adrian Wooldridge from the Economist also suggested that as machines get smarter, more of the jobs open to people will be stupider than the machines, rather than smarter than the machines as has been the case in the past. Despite this, panelists were optimistic about the new jobs appearing in the future. Obed Louissaint from IBM Watson suggested that the key need is to develop the digital skills for the future. These aren't all about technology and people don’t need to learn to code, it’s understanding the context which is key. But it’s also about mindset eg openness, agility and focusing on experimentation. And also understanding that traditional approaches around business cases, ROI etc won’t enable companies to evolve. It’s about understanding the skills needed for the future and giving people the tools. But it's their obligation and responsibility to keep themselves fit, i.e. to learn the digital skills they need. HR needs to invest in our digital skills too, and I thought the conference made a strong contribution to the development of all conference attendees. 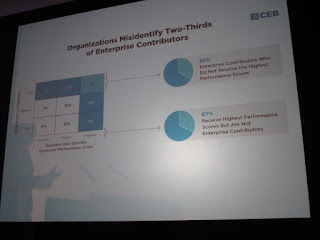 I've been following the CEB's findings on enterprise contribution for several years, often through presentations at previous Economist Talent conferences. So in 2012, I think, they first noted that the proportion of work which is collaborative rather than individual in nature had increased over the previous decade from 20 to 50% - regardless of job level, job type or industry. 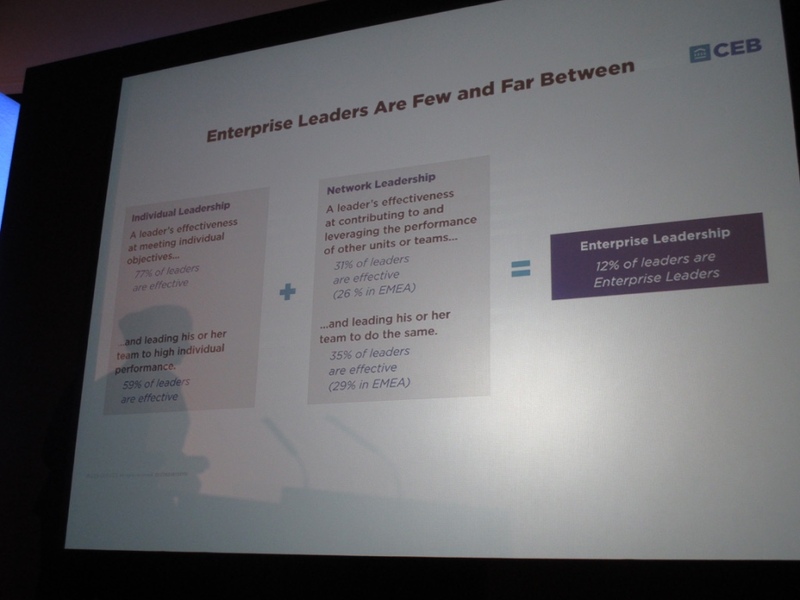 Given this shift, we now need people to be enterprise contributors rather than individual task performance. Enterprise contribution is a combination of individual task performance and network performance. Network performance isn’t about having 1000 friends on Facebook, it’s not the same as networking, it’s using and contributing to the success of others and the broader organisation. It’s about the extent to which people use ideas, best practices, the insight of others for their own performance. And contribute their insight to drive the success of others and the broader enterprise. Brian Kropp at CEB has also been talking about this recently, suggesting that “The formula for great employee performance has changed forever. It is no longer just a case of doing well against your individual tasks. Those who work with and through others effectively are able to achieve far better results than those who work hard but with their heads down – ignoring what happens around them”. His suggestion is that focusing on individual employee performance will only achieve a 3-5 percent improvement. However, enabling effective collaboration can boost profit growth by 11% per employee – with the average revenue per employee rising by £10,500. 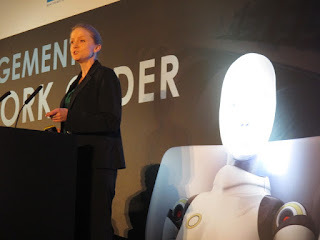 So I was pleased to have another presentation from Clare Moncrieff at this year's Talent conference. This includes a 50% increase in involvement in decision making compared to even three years ago. A half of us collaborate with at least 10 people and one third with 20. The issue is that we’re not holding people accountable for network performance eg 83% of employees’ performance objectives are based on individual tasks. And two thirds of people receiving the highest performance ratings aren’t enterprise contributors. A lot of this is down to leaders as they have a particularly critical role - 37% of people don't think they have the leaders needed for the required contribution. I agree with all these points and also think they are important though I am probably a little less focused on leaders who I think are less critical to network than to individual performance, or at least the leaders need to act in a different way. But perhaps that’s why people are saying they don’t have the right leaders. I also talked to Clare at the end of the session. During the panel she’s been talking about millennials and I remembered one of her comments from Changeboard’s Future Talent conference earlier in the year. Apparently millennials are more not less competitive than older generations eg they are more keen to compare their performance agains others. That has to put an additional challenge onto network performance. Clare suggested millennials can still support network performance but they need to see the impact of their contribution on others eg to have a unique position in delivering to a bigger outcome and with others responsible for other parts of the outcomes. Yes, although I still think there’s an issue here. Although actually, I think they’re probably just so competitive because that’s what they think businesses expect from them. Once we explain it's collaboration that's important, I think we can influence their perspective. It’s a bit like with Matthew Schuyler later. He suggested millennials won’t want to stay with them for long. I think that’s more about them not expecting to be able to. if companies used more of the new practices discussed by Fiona Cannon from the Agile Future Forum later, I think they’d be able to shift this. The same for collaboration vs competitiveness too. My HRPA presentation on the New HR for ideas to develop enterprise contribution. It's just after lunch and Diarmuid Russell from Glassdoor has been leading a session on employee branding in a social media world. 76% of people change their perception of an employer when it is actively involved in responding to comments. Most people in the room suggest they do check their company reviews on Glassdoor, though Diarmuid still explained it for at least one attendee who didn't know what it is. Basically it's about putting the power to make decisions about employment into the hands of the people - based on the fact that people today trust the opinions of people like them rather than experts and company websites etc. In fact two thirds of applicants are more sceptical about claims made by employers than they were three years ago, and that rises to 65% for millennials. 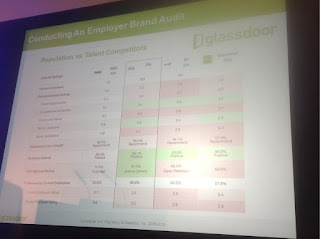 We also looked at Brandon Hall's definition of employer branding as a combination of reputation and image. Image - an employer's public portrayal of the various elements of its unique employee value proposition - from the language used in job postings and advertisements to the message conveyed by recruiters across various channels and mediums. Reputation - the combined sentiments of candidates, employees, customers and clients (past, present or future) regarding an organisation's viability as an employer of choice - usually (but not always) based on first-hand experience. In todays' environment of transparency, Glassdoor helps employers manage, or at least inform, their reputations, which together with image provides the employer brand. I’m at the Economist’s Talent Management summit, opened by Edward Carr, Deputy Editor of the Economist who suggestsed that AI and robotics will have a transformational although traumatic and disruptive impact on businesses and talent. The first speaker has been Sir Charlie Mayfield, Chairman of John Lewis and also of UKCES who developed this theme. John Lewis have been looking at existing hints in today’s world which may indicate business changes through to 2028. Also tech commoditises roles eg you can now use a John Lewis coffee machine and produce the same results as baristas in Starbucks. There's the same shift in advanced manufacturing plants etc. There is a positive too - tech frees up labour which may be very important given the aging workforce. But anyone can do these commodity roles so wages are likely to remain low. There's a nbig difference between the bullseye and those people around the edges. So the trajectory we’re on is one of rising inequality. But there will be new exciting and different jobs emerging between the edge and the bullseye. Uber and Taskrabbit creating something quite exciting - providing flexibility and opportunity for people to use their skills in different ways. We'll also see the emergence of greater and greater personalisation. Eg we'll see more people who can afford it having personalised nutrition plans vs weekly shopping trolleys - formulated individually for them and changing dynamically with their level of health. One problem of our human characteristics is inertia which hasn’t mattered up to now, but as pace of change quickens, our innate skills and core ability to contribute may become redundant. Eg men with elementary qualifications are already finding it increasingly difficult to find employment. We need to work to create a meritocratic society where the workplace is part of a progression of social mobility. 1. The deal around employment - 8 out of 10 people who will be in work in 10 years time are already in work. By 2025, this may be 9 out of 10. These people will need to learn more in the next 10 years than they have in the last 20. We need not just jobs, but learning jobs. Training and development is millennial’s top demand from employment. So we need to deal with these people differently. 2. Training will be delivered via online platforms. 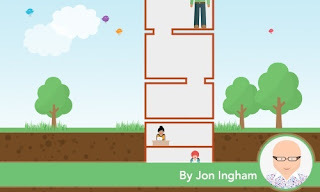 All of John Lewis’ development is now online. Needs a much more serious focus on development and progression, and more people practices pulling on insights from data and analytics. For example John Lewis has looked at the last 7 years of pay data. We need to bring in practices used for customer relationships into employment. 3. The worlds of work and education need to become more integrated. Academic qualifications are only losely aligned with the world of work. And the placit assumption is that they’re all achieved by age 20 and then there’s no more need for learning. There needs to be a much closer link between education and the more attractive parts of the dart board. 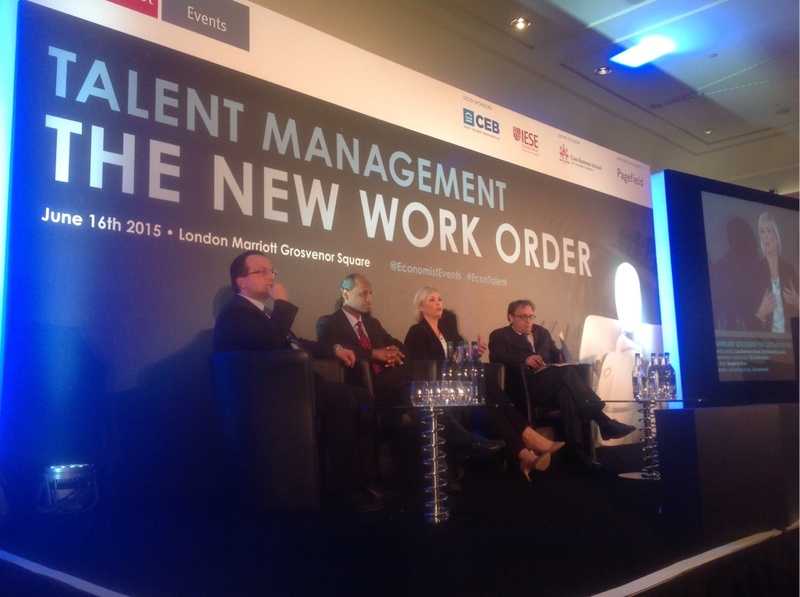 Employers therefore need to collaborate with government to plan the supply side of workforce. And government needs to be a convener rather than just a deliverer. We therefore need to focus on what we need to do to move from where we are now to where we need to go - setting the agenda for talent management, and today’s conference. Also see my recent post on Digital HR. Sometimes the forces build together, sometimes they pull apart - leading to increased complexity and additional challenges. Executives typically have a sense that the world is changing, but don't understand enough about how the change is working so we need to reset our intuition about the world going forward. People don't reset enough. The current changes are a bit like the British Industrial Revolution but ten times as fast, and 300 times the scale. I was pleased that even though McKinsey is well known for being very data based (and you can certainly see this focus in the book) the firm still sees a role for intuition. To me, this is particularly important given the complex mix of forces suggested in the book. I also think extrapolating data into the future is increasingly dangerous to do. And in fact, the book notes that the 4 forces can "play havoc with forecasts and pro forma plans", but of course that's exactly what MGI has had to do. "However data or analytically driven, many executives still reply on intuition. And numbers never prove it 100%. That can mean that executives leave a decision a bit or plan make it later. The point is are they happy to make a decision on the basis of the data that they're getting? It's a bit like what we think house prices are going to do. Data underpins it in a way we're not even conscious of. Over the last few years, asset prices have appreciated, driven by interest rates and global GDP. We've got used to it. So I won't make a good decision if I don't get a forecast, or by suppressing my intuition." The idea of needing to rest this intuition recognises that our intuition which still underpins much of our decision making has been formed by "a set of experiences and ideas about how things worked and are supposed to work." The difficulty is that this acts a bit like recency bias and the anchoring effect in psychology, or inertia in physics. "However we identify it, there is a powerful human tendency to want the future to look much like the recent past." So "if we look at the world through a rearview mirror and make decisions on the basis of intuition built on our experience we could well be wrong. In the new world, executives, policy makers, and individuals all need to scrutinise their intuitions from first principles and boldly rest them if necessary." I'm not quite sure about the suggestion that intuition anchors people to the current state - surely it depends on what people pay attention to? And although I think Richard used the Tom Watson quote about there being room for 4 computers in his session at LSE this week, there are also plenty of examples of forecasts being well over the top, for example ones suggesting that we’d all be flying around with personal jet packs by now. However the book does provide a couple of good examples of anchoring, for example companies allocating the same resources that they had done in the previous year, even when things change drastically, for example in the global recession. My remaining worry is that 'boldly resetting' is likely to be a bit harder to do than the words might suggest. So I think the book is probably right in referring to executives needing to develop the capabilities to rest their own intuition. "HRDs are seeing the impact of cloud systems like Workday. They're not taking 5 to 10% out of their transaction costs but by a factor of 2 or 3 times as they move towards self service vs forms and people. It's a strategic issue because it costs less and people get better service. Employees find it more convenient. But as technology disrupts more jobs and people have to refocus. How prepared is HR to help in that journey?" That led us onto a conversation about employment and skills. As noted earlier, global labour market growth is due to start falling, and finding talent in skilled positions will become yet harder. However as robots and computers take on a growing role in performing activities, and undertaking knowledge work, less lower value roles will be needed. This means that by 2020 "businesses could be short of 85 million workers with college degrees or vocational training; at the same time, 95 million lower-skilled workers could be unemployed." However there needs to be more action too, including better links between business and education. I mentioned an earlier McKinsey labour market report I'd seen which described how South Korea (where Richard has just returned from) transformed their whole eduction approach to provide the skills that country needs. But this is harder in a Western democracy like the UK. Richard didn't have a complete solution to this but suggested that whilst the UK isn't as bad as other places, we need to do more to develop STEM skills, particularly in numeracy, computer programming and confidence in technology. "I find it extraordinary that people can give up maths at 16 and go to university with just a maths GCSE. But the coding in schools curriculum is great - every policy maker around the world I've mentioned it to has asked 'why aren't we doing that?'" 1. Much more external focus. Many execs are very internally focused. That may have made sense during the last few years, to drive performance and productivity. But now they're still not spending enough time with customers, understanding the disruptions. They need to go round Silcon Valley and meet the disruptors. 2. Ability to make companies agile. It's difficult to get actions exactly right so you need to be able to respond. It's amazing to see how some companies respond - for example long debates about cannibalisation. 3. Attitudes. It's easy to see the four forces as a perfect storm where everything is negative. but some of the changes will be very exciting, for example taking a billion people out of poverty, creating a consuming class of another billion people, creating a cancer drug that be tailored to your genome and so on. We think the winners will be disproportionally the optimists. I finished by asking about income inequality which I had noticed Richard had described in a session at LSE earlier in the week but didn't seem to come through that strongly in the book. Partly because of the impacts on employment that I described above, inequality is going to grow further too. Some cohorts of the population have done badly from the changes. In fact Richard suggested that because of automation, de-unionisation, immigration and trade or offshoring, male school leavers have seen salaries decline since 1995. Well inequality isn't in the book because McKinsey are still working on their first research report on it but Richard agreed with me that the impact will be important to society and to businesses too. If we're struggling for skills that last thing we want is more people with-holding their discretionary effort too. I'll be posting on some of the additional challenges of operating in this complex, digital environment, over the next few days and weeks. In the meantime, thanks to Richard for his time and insights - I do think the book presents a compelling outline of the need to reset. These new technologies include social collaboration systems, mobile apps, wearables, augmented and virtual reality, games and simulations. Some of the key benefits of these new enabling systems including fun, transparency, collaboration and analytics. 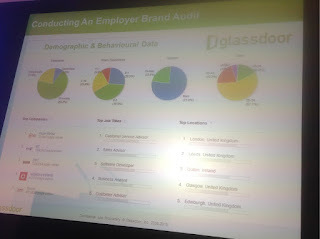 A great example of the new type of HR technology and of the sort of culture which supports it is social recognition. Traditional recognition was very transactional or value for money focused, usually involving limited amounts of recognition and perhaps once a year recognition ceremonies with awards being given to just a small number of employees. More recently this developed into a broader, adding value focus in which managers were responsible for recognising members of their own teams and the focus of recognition became a bit more strategic. This shift has now progressed even further with new-style social recognition systems allowing everyone in an organisation to freely express their appreciation of one another and to understand what it is about what they do which other people value. Managers can participate in this process of appreciation but the more fundamental focus is employee to employee, human to human." More details are on the Workstars blog. The basic point is that digital technology can help humanise organisations and their HR approaches, putting the H back into HR, by enabling people, freeing them up, to provide more of their potential contribution. So for example, rather than making people follow automated processes which are designed purely to meet business needs, and then worry about their engagement, it provides people with compelling technology which enables them to do more, and be more engaged in the process. Social recognition, like Workstars, is a great example of this technology, so do check out their site! As I posted yesterday, I think we need to define digital business / digital HR quite carefully, or it risks just becoming a catch-all term for broader transformation, which I think is a shame, as you then miss the specific aspects which digital is about. 'We have been thinking about the scope of the Enterprise 2.0 SUMMIT for quite some time. 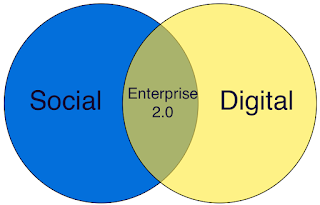 For a while now our beloved expert community has been telling us that “Social” has moved on, the “Enterprise 2.0” term is “dead” and that our conference heading doesn’t match the general “zeitgeist” of the current business landscape. Now I wouldn't personally say that social is dead - far from it (and I hate the expression anyway) - but again, it depends upon what you mean. The graphic above is my representation. Social is one big trend, and a particularly significant one in HR, but one that was never really picked up in Enterprise 2.0 circles and is only now really being developed within HR and the rest of business. The focus of this is about developing relationships rather than just people, or social capital rather than just human capital, and doing this through everything we have at our disposal within HR, as well as aligned fields, eg workplace design. 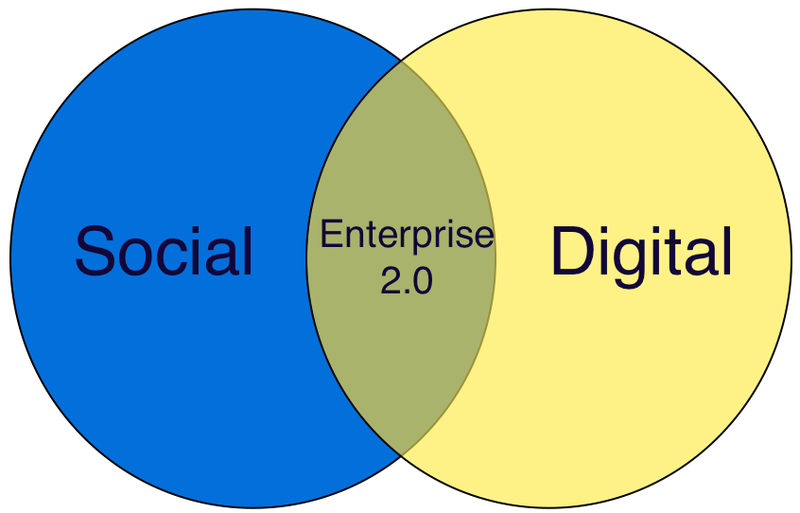 Enterprise 2.0 is (not was) the intersection between the two - the use of digital technologies to achieve social outcomes. Now as we all know, Enterprise 2.0 never managed to live up to the hype. Altimeter's findings that only 36% of collaboration networks have many people using them absolutely echoes what I see happening in organisations. 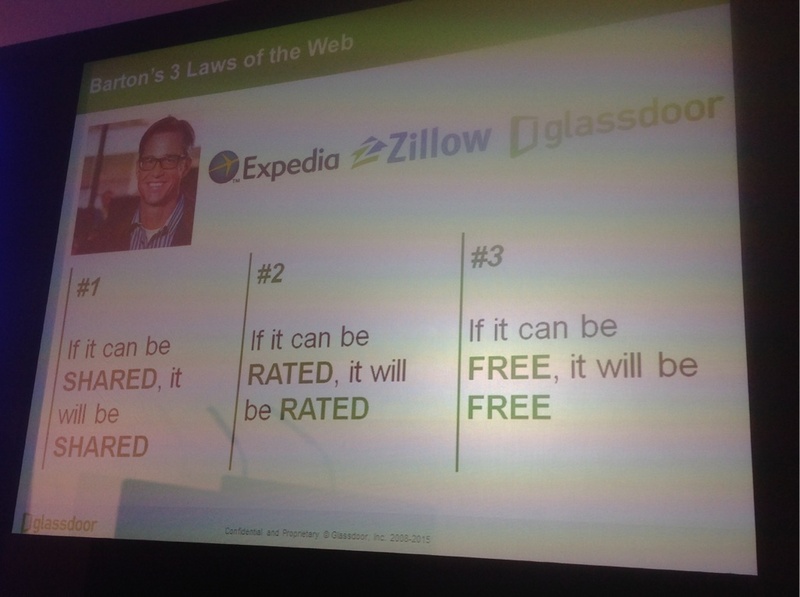 So is social / enterprise 2.0 really dead? Only if it's seen as the little bit in the middle of the venn diagramme i.e. the implementation of stand-alone enterprise 2.0 systems without social objectives. But if it's seen as the connecting point of two critical trends - social relationships, and digital (both still very much alive) then it's still at a very early point in its evolution. But social and digital can also be implemented separately and independently, and we shouldn't confuse one with the other, even if they're often going to be implemented as part of the same change. There's an interesting article in HR Magazine today suggesting that organisations are at risk from a digital delusion which is about seeing "digital as a synonym for technology and therefore about HR systems." I think the point is a good an important one - 'digital' is hard to understand. I agree it's not just about technology, but then if it's not, what is it about? 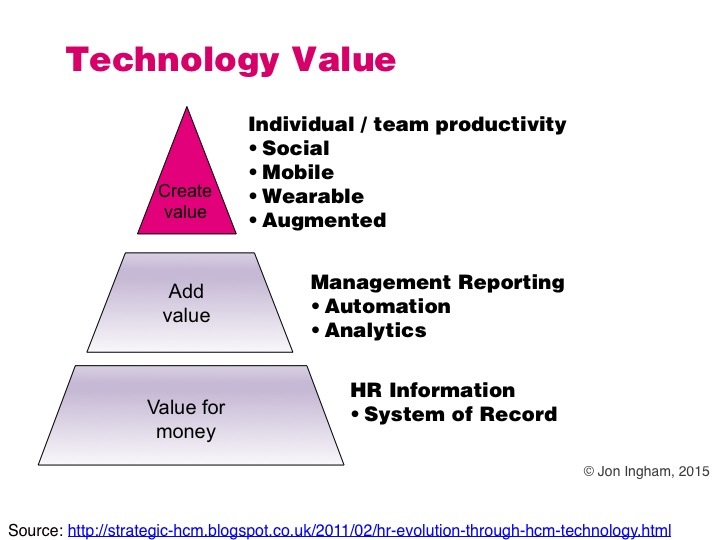 Well I'm going to be blogging on this later on today, but it's worth emphasising that one thing it's not is HR systems! 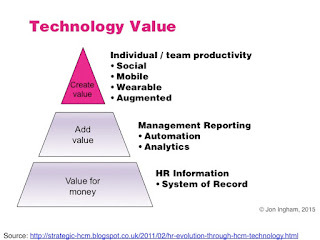 A few years ago I blogged here about different levels of HR technology based upon the value triangle I use as the basis for a lot of my consulting and training. "In creating value, value comes from the organisation’s employees, rather than how these people can be managed to meet existing business needs. Technology can create value by pointing to particular potentially valuable capabilities, but it is more likely to have this impact by helping employees to increase the value they can provide. This is why I’m so interested in social and mobile technologies – they get beyond HR’s system of record and the line manager focused talent management system to actually increase employee contribution. So for example, a social performance management system can help employees get feedback from the people they work with, to share the reviews with these people and to participate in a review of a whole team. It helps them take ownership of their own review and hence is likely to have more impact on their performance. Of course, social technologies aren’t the only way of doing this – for example, I was involved in a self rostering system for train operating company staff a good ten year ago which had much of the same effect. You can identify opportunities for creating value from technology by focusing on the people in the organisation – their engagement, capabilities and other aspects of their human and social capital – and thinking about how these capabilities can be extended. This is why I’ve been commenting on the need to focus on people and behaviours, not on technologies or tools." 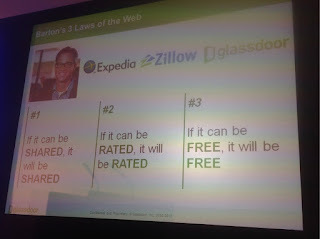 This is the basic insight we need to hold in mind in understanding digital business and digital HR. Digital business / HR is about technology for people and teams, not to improve management or HR data. And because it's for people and teams, it immediately becomes more complex than any other areas of technology we'll be more used to, eg HR systems. The tendency then, as the article suggests, is to assume that digital is about everything we're seeing in today's business world eg fast pace, omi channel, flat / flexible structures etc (from the article) - which of course it can be. But broadening the definition out this far renders the term to be largely meaningless and reduces the chance that organisations will do anything about it. So we still need a way of thinking about digital which isn't just about the technology but also doesn't incorporate the whole world of business.